Picture this. A burglar or an intruder tries to hijack a car in a parking lot. Thankfully, you have got a CCTV Surveillance System installed. But just as the CCTV security camera is about to capture his face, there is a flashing glare from the windshield of a passing car and all that the camera records is a blurred shadow. This is a common problem with normal CCTV cameras that are installed in places that have varying light conditions. The problem is that in normal CCTV Cameras the sensor is not equipped to react to these conditions and hence, on more occassions than not, the result is a low quality or blurred image. WDR or Wide Dynamic Range CCTV cameras on the other hand can capture perfect images in all kinds of lighting conditions. In simple terms a WDR CCTV Camera is capable of displaying both the lightest and the darkest elements in a single image without missing out on detail. If you have a normal indoor CCTV camera that is pointed towards the door or the window during daytime, then there would be an extremely bright backlight due to the incoming daylight which results in a washed out image. Some CCTV security cameras were equipped with a technology called BLC or Back Light Compensation which aimed to solve the problem. But WDR CCTV Cameras have two CCD (charge coupled devices) which takes multiple captures of a single image to produce a high quality image sans blurring. 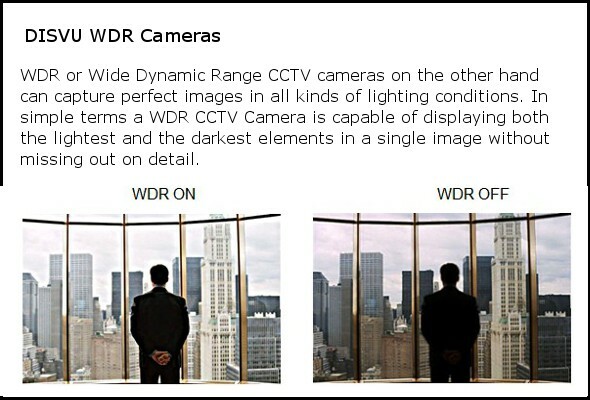 A WDR CCTV Camera can be used in any place where the lighting conditions are not constant. They can be used outdoors in parking lots, streets, they can be used indoors if you wish to point your CCTV towards the door, it can be used in ATMs, it can be used inside the closet also. Informative is post on CCTV cameras.Security is most important as crime is increasing is day by day.Thanks for sharing the post with site visitors. Cool blog. Check out my blog. 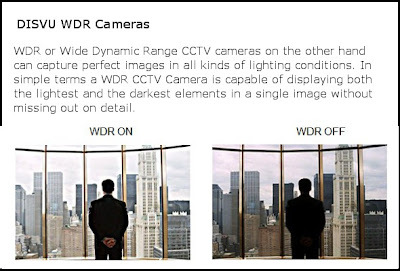 WDR are the only cctv cameras to work equivalent to HDR mode of phone cameras.